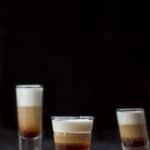 This layered shot makes a terrific nightcap because it is very soothing! 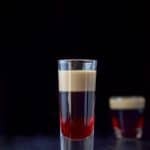 I call it the hop a 747 layered shot recipe! 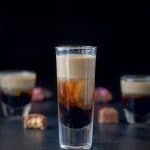 One of the great things about layered shots is their delightful melding of flavors. One of the bad things about layered shots is that they are over so quickly. You can’t really sip a layered shot. Well, that’s not true. You can. But if you don’t down it in one go, you don’t get to experience all the flavors together in one fell swoop. That would be tragic. Okay, not exactly tragic, but sad to me. So, let’s talk about this 747 layered shot! I was doing a little research to find out why it was given that name but I couldn’t find the reason. Anywhere. So, I made up my own. An individual that we shall name Harry, who, by profession was a bartender, got on a 747, also known as a jumbo jet. Harry was going on vacation to the Bahamas! 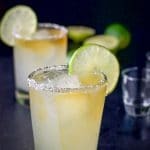 He was excited because it was his first time visiting those tropical islands and he was looking forward to researching the different cocktails he would be imbibing! Harry had a window seat. He was dreaming of delicious concoctions while he was looking out the window. As he came out of his rumination, his eyes focused on the clouds. They were beautiful, grand clouds that billowed with a mysterious darkness underneath them. Harry’s eyes shot open wide. He sat up straight, slapping his hands against the window, startling the passenger sitting next to him. The person, whose name was George, nodded warily, furtively looking around for a flight attendant. He wondered, no, he hoped that perhaps there was an empty seat somewhere on the plane away from the lunatic sitting beside him. Then George looked more closely at the cloud Harry was still pointing at. Why yes. Yes, it did look like a delicious layered shot! George asked shyly, “What would you put in the jumbo jet shot? That may be how it went! Can’t you just picture it? We have Frangelico front and center, Kahlùa right behind and lastly the Bailey’s Irish cream. You can also see the pourer next to the Frangelico, which makes constructing layered shots sooooo much easier. I got mine here (affiliate link, see side bar for disclosure). You will also see my cocktail stirrer spoon which is also essential for layering a shot. I get my shot glass and fill it 1/3 of the way with Kahlùa. You have to use the heaviest liquor first and Kahlùa fits the bill. Next up is the Frangelico liqueur. I open the cute bottle of Frangelico, shaped like a friar’s robe complete with rope belt, and stick the pourer into it. I also take the spoon and put it in the shot glass bowl side up! I carefully pour the liqueur over the bowl. It combined with the Kahlùa more than I thought it was going to, but don’t stress about it. These two liqueurs probably have a very similar weight to them. Time to put a pourer in the Bailey’s. I take the spoon, place it in the shot glass above the liquid and carefully pour the Bailey’s over the spoon bowl. As you can see, the front left has a cloudiness to it. That’s where the spoon was. It will disappear as time goes by. But even if it doesn’t, just face it away from the person who is going to shoot the shot. Especially if he’s named George. Let’s see the 747 layered shot by itself. See how the Bailey’s Irish cream is billowy on the bottom of the layer? Clouds! Can you see them? Let’s look at it from a more vertical view. That’s it. All that is left is to pick up the shot glass and shoot that bad boy down the gullet. Please feel free to share and share alike. 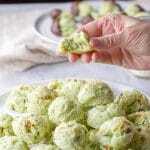 Pin any photo to Pinterest, Yum the recipe to Yummly and leave me a comment. If you’ve tried this 747 shot I’d love the hear what you thought about it in the comments below. I love hearing from you! You can also FOLLOW ME on FACEBOOK, TWITTER, INSTAGRAM and PINTEREST to see more of my delicious food and delightful cocktails! I enjoyed reading the story behind this shot – I think it would make a gorgeous dessert! The blend of flavours is really lovely – a sweet treat indeed! April! Thanks so much and yes, the blend of flavors is yummy! I have all three bottles of liquor in our bar … I might just have to give this a try! Thanks Thanh! It’s an awesome combination! That Frangelica bottle is pretty cute, isn’t it. It helps me feel a little bit more angelic when it is around (is that a contradiction. . .since it is liquor and all? ?) Anyhow, this is such a fun shot. I love the different layers. The Frangelico is hazelnut and the Kahlùa is coffee flavored, so all of them together is fun and smooth. I hope you do try it! Very tasty looking. I’d like this a lot!